That blows the girls’ skirts high! To blind the old man’s eye. Of course El Hierro is windy. It’s an island. It’s in the Atlantic directly in the line of the northeasterly Trade Winds that blow for most of the year. Like water in a rocky stream, where their passage is obstructed they whip around the sides and over the top of the island. Little more than persistent sea breezes at sea level, higher up and in the east and west of the island solitary trees become wind-cripples – in fact the island’s emblem is a grotesquely twisted juniper (Juniperus phoenicea). Sometimes we get stronger winds, usually from the north or northwest, with gusts above 100 km/h. The strongest I’ve experienced were gusts of over 150 km/h which broke a large apricot tree in half and blew away our greenhouse! However, our wind is also responsible for one of our island’s claims to worldwide fame. We will one day generate from the wind 100% of our domestic consumption of electricity. 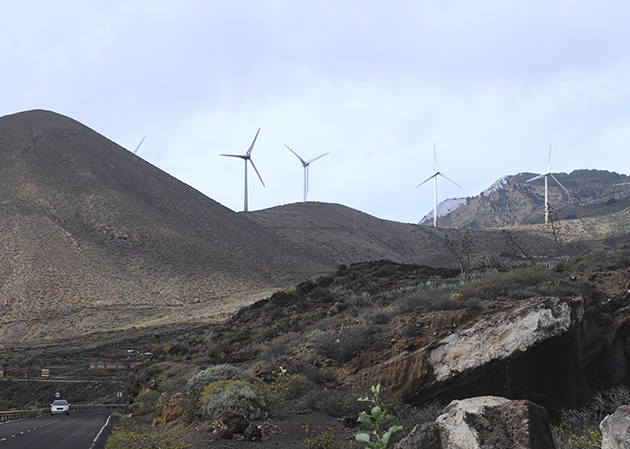 When you come up from the airport you’ll go round a bend and suddenly see five gigantic windmills peeping over the mountains at you. They gyrate slowly and don’t make that “wishy” sound that some do, only a deep baritone hum of heavy gears. The idea is that the electricity they produce supplies the grid and also pumps water up to a deposit which is really just a crater lined with plastic. On those days when there is no wind the water from the crater rushes down through turbines to generate the electricity the still air is not generating. In other words the craterful of water is a sort of gigantic battery! An afterthought: as far as I know this project has hardly any negative effects on the environment. In fact, I think the wind farm actually livens up the rather desolate landscape where it is sited.